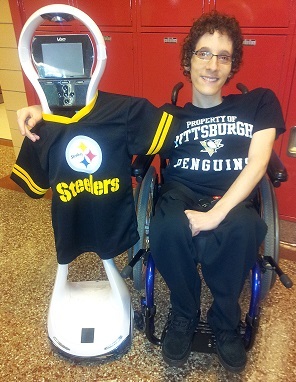 Pittsburgh, PA, October 15, 2015 – The VGo telepresence robot has given Cris Colaluca the gift of academic and social freedom, and the ability to stay involved despite medical limitations. Cris’ life has been so impacted that he wishes that other homebound children can also enjoy the same freedom. Now, Make-A-Wish of Greater Pennsylvania and West Virginia is giving that same experience to other students by donating a VGo telepresence robot to Children’s Hospital of Pittsburgh of UPMC. Due to a rare seizure disorder, Cris had difficulty attending school in person. But in 2012, Cris began attending school remotely through the use of the VGo telepresence robot. Cris has been able to connect with fellow students, interact within the classroom environment, and participate in social events. These experiences which are typical of a teenage high school experience are extraordinary for Cris, now 17 years old. Today, at 10am at in Eat ’n Park Atrium at Children’s Hospital of Pittsburgh, Cris will give a presentation about his personal experience with VGo as well as introduce the VGo he is donating. Judith Stone, President and CEO of Make-A-Wish® Greater Pennsylvania and West Virginia, and Dr. Steven Docimo, Chief Medical Officer of Children’s Hospital of Pittsburgh of UPMC, will also speak during the event. The event will include a Q&A session with Cris as well as a chance to interact with the VGo. In anticipation of this event, Senator Marco Rubio and Dr. Ben Carson, 2016 Republican Presidential Candidates, have sent video messages recognizing Cris as an inspiration to others. Read Cris’ story about when he first started using VGo. Vecna’s mission is to empower humanity through transformative technology. Vecna provides innovative solutions for application in education, healthcare, hospitality, logistics and enterprise business. VGo, a robotic telepresence solution, allows an individual’s presence to be replicated in a distant location such that they can interact and perform tasks in ways not previously possible. Now a student can see, be seen, hear, be heard and move around in any school – just as if they were there. Vecna delivers better technology to realize a better world for all. Learn more at Vecna.com/education. Regionally, nationally, and globally, Children’s Hospital of Pittsburgh of UPMC is a leader in the treatment of childhood conditions and diseases, a pioneer in the development of new and improved therapies, and a top educator of the next generation of pediatricians and pediatric subspecialists. Children’s Hospital has fulfilled this mission since its founding in 1890. Children’s is named consistently to several elite lists of pediatric hospitals, including ranking 7th among children’s hospitals and schools of medicine (FY 2014) in funding for pediatric research provided by the National Institutes of Health, and is one of 10 pediatric hospitals in the United States named to U.S. News & World Report’s Honor Roll of America’s “Best Children’s Hospitals” for 2015-2016. Make-A-Wish® Greater Pennsylvania and West Virginia is a non-profit organization that grants wishes to children, aged 2 ½ to 18, with life-threatening medical conditions. Currently, the local chapter is one of the most active in the country, having fulfilled more than 16,000 wishes. For more information, please call Make-A-Wish at (800) 676-9474 or visit its Web site at greaterpawv.wish.org.